Quantum Newport (QN): Congratulations on the win! As the sailmaker, of course the first thing we need to ask is – How was your speed? Ed Adams: It was good. Upwind we were very consistent. There was rarely a condition [light air or heavy air] where we couldn’t make the boat go fast. At times in light air when we weren’t faster than the boats around us, we had to make an adjustment or two to get going faster again. As usual, in heavy air we always had excellent speed. Ed: Amazing boat speed! I think we passed 100 boats downwind over the course of the circuit – that’s not a hyperbole, I think we passed 100 boats. Have you done any other tweaks to the Runner since we worked on it a couple of years ago? QN: No, other than getting the tweaks hardwired into production a little more consistently, it’s still the same Runner we’ve been making for the last two years. And how about the VMG Spin? [Ed carries this as a second spin, suited specifically for light and lumpy conditions]. Ed: Ok, wow. That runner was fast; very stable. We didn’t use the VMG as much, but when we did, it gave us an edge as usual. QN: Any other feedback from the Circuit? Ed: Consistency was the key because you only get one throw out in the circuit. I think we threw out a 15 or 16 overall. Most of our scores were in the top 10. There were guys who got 1, 2 or 3 OCS over the course of the circuit. You could win two regattas and not win the whole thing. You could even win all three events with an OCS in each, but you couldn’t win the overall. QN: So avoid the OCS. Ed: Yes. My crew [Nancy Haberland and Ben Cesare] got a little frustrated with me because I was really conservative on the starting line and got a lot of bad starts. I was not pushing the line too hard. If you took our position at the first top mark we probably would have been tenth overall, but we made a lot of comebacks. QN: You got a second at Savannah, can you tell us about that? Ed: We should have won the Deep South. I got stuck on the Leeward mark. After we cleared ourselves of that we ended up with a 16. We should have gotten a nine. But, conditions in Savannah were fun. Racing there is like frostbiting a river or sailing in Charleston. It’s like college sailing: shifty, lots of current – fun. 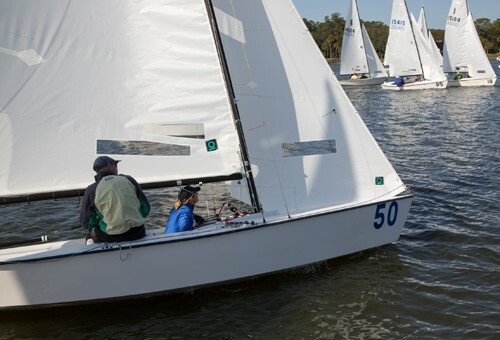 Click here for information on Quantum's fast Lightning sails.